I didn't grow up eating pecans - my dad dislikes the very thought of them (along with sour cream, cottage cheese, and cranberries), which means my mom didn't even bother to keep them in the house. But oh dear, do I love them now! Rich and buttery, they're just.so.good in cakes, pies, cookies, salads, turkey stuffing, et cetera, et cetera, et cetera (The King and I, anyone?). 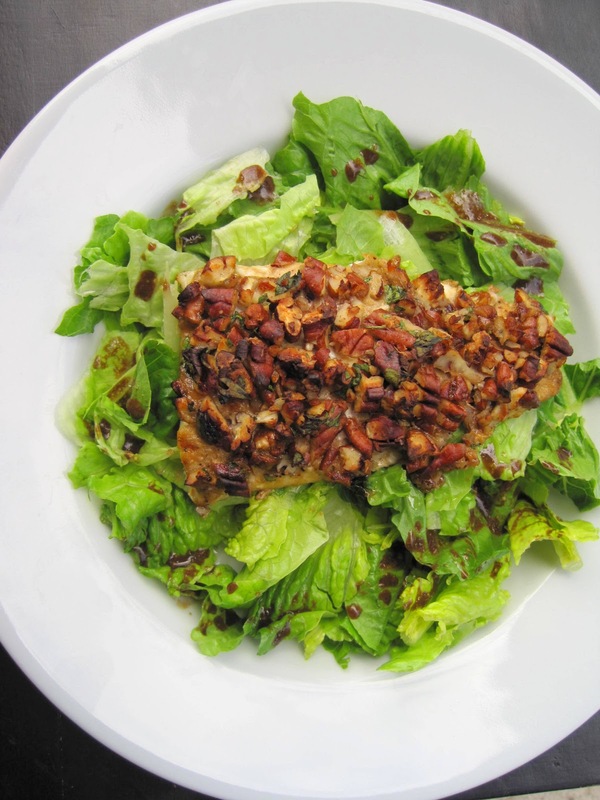 Enter: pecan-crusted fish - a guilt-free way to savor those yummy nuts in a lean protein-rich dish. Taking just a few minutes to prep and 10 minutes to cook, it can then easily be thrown on a salad with a simple balsamic vinaigrette. Voilà! The perfect - bridesmaid dress approved - lunch or light dinner. Rinse off the fish and cut into 4 filets if necessary. Salt and pepper each side and place in a single layer, skin side down, on a parchment paper-lined baking sheet. In a small bowl, whisk together the mustard, butter, vinegar, and honey/agave nectar. In a separate bowl, mix together the pecans and cilantro. Stir in about 2 tsp of the mustard sauce and mix until blended. Brush the remainder of the mustard sauce evenly over the fish. Spoon the pecan mixture over the sauce, lightly pressing to help it adhere. Bake for 10 minutes or until transparent and flaky.